The novel AIMS? 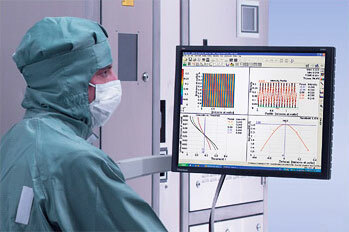 45-193i offering a maximum NA of 1.4 meets the stringent requirements for advanced photomask evaluation for the 45 nm node. Based on an entirely new platform the system enables the emulation of future 193 nm immersion scanners. Main system improvements of the AIMS? 45-193i include polarised illumination and a novel vector effect emulation capability which allows the study of rigorous polarisation effects as they appear from reticles and the scanner technology itself. The system achieves specifications enabling emulation of upcoming scanner generations already today. To approach exact real world scanner illumination conditions the optical beam path is completely inverted and the mask is now handled "face down". The CCD camera is in the same position as the wafer below the mask enabling scanner comparable emulation conditions. Looking onto a mask in the same way as a scanner the AIMS 45-193i achieves significant tighter specifications. 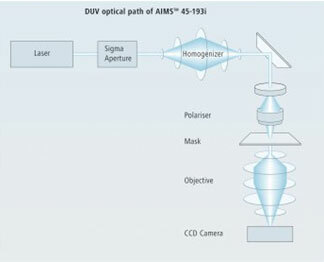 To guarantee best optical performance with AIMS measurements the visible light beam path has been separated from the DUV beam path enabling the usage of optimally adjusted optics. A new beam homogenizer is implemented in the AIMS 45-193i providing best uniformity results for field and pupil homogeneity.